Chris, of the popular vegan food blog Eat Air, observed in a post last week that the overwhelming majority of vegan food bloggers are women. To address this disparity and provide some good male role models for his son, he posted a challenge to the men of the house: Cook something and then write about it. So, he was planning to do a little cooking over the weekend, but on Thursday morning, I woke up with lower back and hip pain that worsened over the next few hours so that by dinner time, I could barely walk. For the next three days, D took over all the household as well as parental duties, even spending all day Thursday at the district science fair with E (proud parent moment: she won 6th place in microbiology for her project on yeast). We ordered take-out on Thursday night, but for every other meal, D was in the kitchen cooking. Unfortunately, no photos were taken, dashing his hope of food blogging glory. Still, he was my hero, singlehandedly taking on everything while I sat by helplessly, back pressed up against an ice pack, popping pain killers and reading mystery novels. By Sunday night, resting, icing, and stretching exercises had reduced the pain so that I felt steady enough on my feet to attempt to cook. 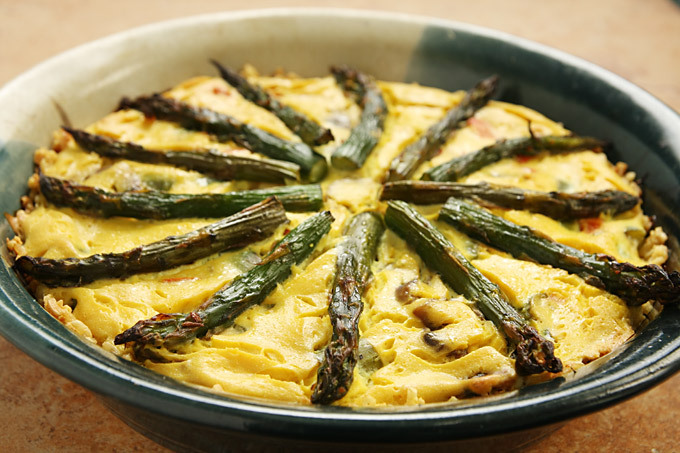 Sitting on an ice pack had given me a lot of time to think about what I wanted to do with the asparagus in my fridge, and I’d worked up quite a craving for quiche. Vegan quiche, that is. I could have added asparagus to my Mini Crustless Quiches, but I wanted something a little more filling. I decided to try making a full-sized quiche with brown rice as a gluten-free, fat-free crust. I’m happy to report that it was an resounding hit, adult as well as kid-friendly. I’m not so happy to report that it remains a light meal–light in the sense that it won’t fill you up. Though I’ve written it up as 4 servings, the three of us finished the whole thing and would have put a big dent in a second one, had there been one. My advice for this quiche is the same as for the mini quiches: Serve it with plenty of side dishes or be prepared to make a double batch. Brown rice makes a crispy, chewy crust that makes this quiche more satisfying without adding refined flours and fat. 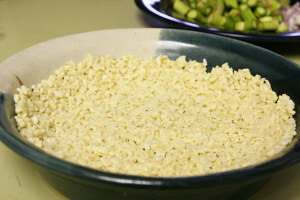 Mix rice with 3 tablespoons of the tofu mixture and the vegan parmesan (optional). Add freshly ground black pepper to taste. Unless you are using a non-stick pie pan, spray with cooking spray or quickly wipe with canola oil, and press the rice into the bottom and up the sides of the pan. 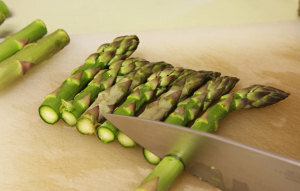 Snap the tough ends off the asparagus and discard. Cut off the top 3 inches and set aside. Chop the remaining stalks into 1/2-inch pieces. 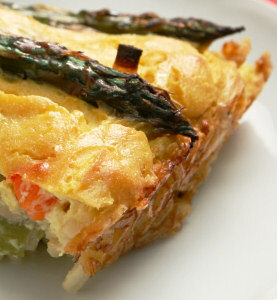 Spread the vegetables (excluding the asparagus tips) on top of the rice crust. Pour the remaining tofu mixture over the vegetables, stirring lightly to distribute it through the vegetables. Arrange the asparagus tips over the top. Tip: Make this lower in fat by using lite silken tofu and fat-free soy milk: 200 Calories (kcal); 2g Total Fat; (10% calories from fat); 11g Protein; 34g Carbohydrate; 0mg Cholesterol; 485mg Sodium; 4g Fiber. I see why you gobbles the whole thing. Very delicious. Tofu ‘cream’ is a neat trick. Love, love, LOVE your blog! You’re getting me excited about cooking again!!! Question to you and all your wonderful readers: I’m an overweight vegan. I certainly don’t choose veganism as a weight loss tool, but…what the heck? My doctor says I’m eating too many carbs (hellloooo, of course), and that I should eat meat! I told her I don’t care if I never lose another pound, not gonna do THAT… any ideas besides: eat more vegetables? I exercise like a freak (and I enjoy it, so I don’t think I can do more there). Is it possible that I DO eat too many carbs? They’re about 60-65% of my daily calories (yes, I track nutrients, etc…), so I know…THANKS!!!!!!!!!!!! I’m not vegan, and so when I saw the link to your recipe thought…no way…vegan quiche? But this sounds and looks amazing and I’m going to give it a try — I might as well take the plunge! Yum. I was just craving quiche, and your photography, as always, makes me feel like I can just reach out and grab a piece. I will definitely try this recipe. 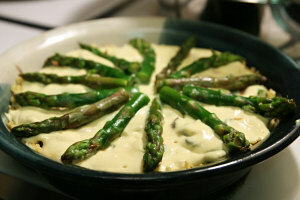 Since it’s asparagus season, I’ll start it with the “cream” of asparagus soup I make, followed by quiche and salad. And I think I’ll take your advice and make the double batch. If it’s that good, and we don’t finish it all, I’m sure this makes a wonderful leftover lunch! A brown rice crust? waw, that’s a good idea for a quiche. A very good one indeed! I’ll give it a try, I’m craving quiche lately. thank you for the gluten free crust. That quiche looks really tasty! I can’t wait to try this out, looks fantastic. My vegan boyfriend is a dab hand at the cookery, but I’ve never managed to get him into blogging. I’ll have to try and document it for him! Fatmom, have you ever checked out Dr. John McDougall’s site at drmcdougall.com? He’s an MD (internist) who advocates a very low fat, starch (complex carbs)-based, whole foods vegan diet. He offers an Extreme Weight Loss Plan as well as his regular McDougall Plan (which I’m on). You’ll lose weight on both, but will lose it faster on the Extreme version. I attended his 10-day live-in program last Oct for my M.S., and several classmates went on the extreme weight loss program and did really well. Since you’re already a carb-loving vegan and fan of FatFree Vegan, I think either McDougall Plan would be your cup of tea and work well for you. He’s got all the info (including recipes) you’ll need for free on his web site, and a good library should have his books, cookbooks and/or DVDs. And the FFV recipes work great with little or no modifications with McDougall too! Hope this helps & best of luck! Mmmmmmmmmmmm… I think I have all these ingredients at home right now! Mea culpa, fatmom, it’s called the McDougall Maximum (not Extreme) Weight Loss Program! 🙂 And Susan has some MWLP-friendly recipes at http://www.fatfreevegan.com/mwl/index.shtml. Can this quiche be cooked ahead, frozen, and reheated like quiche made with egg? I’m always looking for recipes to grab out of the freezer and pop into my lunch bag. I am glad you were feeling well enough to cook and share this delicious sounding recipe, Susan! How are you feeling? I hope that your hip/back is doing much better! I’ve made this crust before and it was a wonderful find. Glad to see I’m not the only one using it! Just finished eating this…scrumptious! The “crust” didn’t really stick together very well and came out more like a casserole. Delicious all the same, but any suggestions to make the bottom stick together? This sounds so great, Susan! I’m always happy to discover an old favorite that can be made gluten free and vegan. Thanks! this is one of your recipes that I have been keen to try for ages and this reminder makes me push it up the must-make list – although sadly asparagus is not in season in melbourne at the moment! Noelle, I would be afraid to freeze it. Tofu completely changes consistency when it’s frozen, but it’s possible it could turn out okay. If you freeze it, please let me know how it works out. Thanks, Courtney! I’m feeling a little better and am going to the doctor tomorrow to try to figure out what’s going on. Chrisj, my crust was a little crumbly, too. I don’t know how it would taste, but next time I might try pulsing the rice in the food processor a little, to make it stickier. That is the most delicious looking thing I have ever seen in my life. This looks better than a krispy kreme sandwiched by two cinnabons. I’ve made the crustless quiche before! I just made this quiche and it is the best quiche I have ever had. Thanks for all your recipes Susan! I can’t wait for the cookbook. I love the idea of the brown rice crust. My head is full of about a million different filling possibilities. Again, thank you for the gluten-free crust. Either way thanks for being awesome! Susan, your photos are absolutely mouth watering. On a personal note, I had the good fortune to meet Alanna of A Veggie Venture in person Sunday, and she says “hi”. I’ve seen your mini quiches ALL OVER the internet and they’re on my list to try! Hey Susan! I have an idea, use short grain brown rice and cook it really well! Use more water maybe, and drain? Also helps the rice become softer other than stickier. I love quiche! Remember having a bacon and egg quiche two years ago, I was looking for a vegan quiche, so your recipe looks really tempting right now. It’s too bad asparagus cost a bomb in Singapore. Glad to hear you’re feeling better!!! The quiche looks fantastic! I think I may make one tonight. Very beautiful photo. And interesting crust pie process. This looks pretty amazing, but i’m really not quite sure about “nutritional yeast”… although I’ve seen it on quite a few blogs i’ve been reading lately. any help with what it is, where to find, or substitutions? thanks! great site thank you so much for sharing! Here’s a link to information about nutritional yeast. In a nutshell, it’s an inactive form of yeast that I use for adding flavor. It tastes kind of cheesy or nutty, depending on your point of view. It’s also an excellent source of B12. Look for it in natural food sections either in packages or in bulk (best value). I love doing a brown rice crust, there are so many variations. Susan, thanks for a fantastic post. I made this quiche today and it was delicious. The “crust” held together just fine. Love your blog! Totally delicious. Mine did turn out a little more like a casserole in terms of not slicing very neatly, but I’m definitely making a double recipe in the future, and I found it to be very filling! One slice and two vegetable sides, and I was full. That settles it: My family and I are PIGS! (Not to insult pigs, who are smart, sensitive animals.) In my defense, I think I served it alone, without any sides, and by the time I got it to the table, we were starving. This looks delicious, Susan. I’ve just recently started using tofu in dishes that call for eggs like quiches and frittatas, and it’s amazing how well it works. Minus the “eggy” smell, which is a huge bonus! Oohhh, this looks delish! Just in time for Spring! Wow, D really stepped up to the challenge. Glad your back is okay. 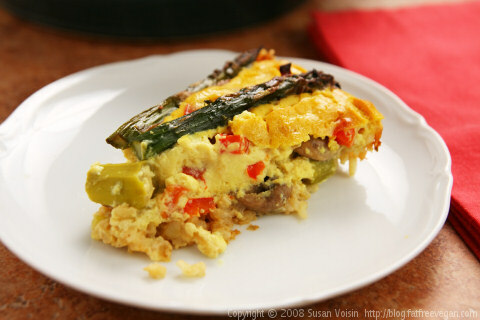 Another great-looking take on your crustless quiche recipe! I just made your omelettes again…. It’s amazing that tofu can do that! I hope you’re feeling better now, Susan! I made this quiche this weekend – two batches! It is awesome! It’s lite but filling alongside steamed veggies! I’ll definetely be making this in the future and will incorporate different veggies as they are in season. This looks simply wonderful. The type of dish my family would love to eat. Thanks for sharing! Very good, I prepared it for a potluck lunch yesterday. I was a little disappointed that the rice crust crumbled so much. Any tips for a firmer crust? I love your blog! I’ve browsed a number of your recipes now and I’m sure gonna try them. The only thing is that I have a soy intolerance. So, I’m quite limited for choice. But there loads more recipes out there to try! I just tried a version of the brown rice crust a few days ago–found it in an old Jane Brody cookbook. That crust, however, wasn’t vegan. Glad to have a vegan version to cook or point people to! 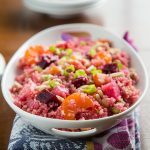 I tried a quinoa version this past weekend, which turned out great. 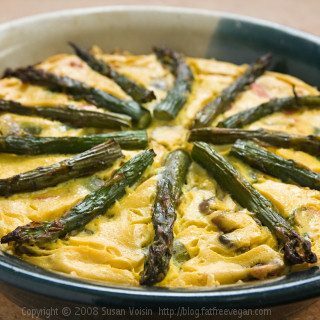 I prepared this quiche on Sunday with a side of roast veggies and it was absolutely delicious – creamy from the tofu and asparagus and I really liked the brown rice crust too. 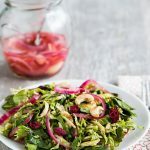 You create some of the best recipes I’ve ever come across for people who want to cut the fat without cutting the flavour – keep them coming! I’ve been toying with a number of quiche recipes lately and this was, by far, the best. I made two batches of it, so that there would be enough for lunches for all of us. It tastes great as room temperature brought-to-school lunches! My crust held together fine but was a little too crispy–next time I won’t leave too much “crust” poking above the rest of the filling. It was delicious! We have been looking for vegan recipes to serve to some of our Elderhostel guests and patrons at Skamokawa Center Historic Inn and Kayaking. This recipe looks delicious – I can hardly wait to try it! The brown rice crust looks so versatile. I’m looking forward to perusing more of your recipes! My mouth is watering. I’m kind of bummed, though, because I actually don’t think this is WW core… I think the cornstarch throws it out of the running : ( Not going to stop me, though! BTW, Susan, so glad to read that you and family are alright after that storm. Best wishes in putting everything back together. yummy! I posted a pic of my rendition on my blog here: http://craftyveganmama.blogspot.com/and it came out so nicely! My 2 year old, husband and mom all cleaned their plates 🙂 thank you! What a wonderful recipe! I loved it, and so did my omnivore husband! Thank you!! I posted a picture on my blog of the quiche I made based on your recipe, with a link to your recipe. Thanks; I love your blog! the rest of my family don’t like it. but ithink that’s just because they’re too preoccupied with their chicken wings and bacon strips to give it a chance. will it keep in the fridge overnight? and also, is the nutritional info for one serving or the whole quiche? I'm glad you like the recipe. It will keep fine in the refrigerator for a few days. The nutritional info is for 1/4 of one pie, so multiply each number by 4 to get the info for the whole pie. My best friend and I made this recipe last night. IT IS DELICIOUS! We highly recommend it. Everything looks so yummy. Think I’m going to borrow a couple of the recipes, especially the smoky black bean soup and the Korean noodle stir fry. Hope I can find some buckwheat soba noodles in my store. I just made this 🙂 I already tried your mini quiche, a version with asparagus actually, yum. I kind of changed this a lot, haha. I roasted the asparagus and pepper as well as eggplant instead of mushrooms. Also, I just mixed it all together instead of trying to make the crust. It was very good, but…I was expecting that! i just tried this tonight. i used quinoa instead of brown rice and substituted broccoli for the asparagus and topped it off with tomato. yum! thank you for sharing! Thanks for another fantastic recipe. I made it this afternoon and, served with baby spinach and cherry tomatoes, it was perfect for a light dinner when I got home from the gym this evening. Definitely one to be made again and again. I can’t express myself I thankful I am for this huge and lovely healthy community, here in the US, willing to share their knowledge about cooking wonderful, delightful and healthy dishes! I tried this last week, we, in Portugal, don’t cook asparagus as much as you guys do here. So, as I like to try new things, I decided to make something different. As I always have brown rice cooked and ready to eat, this was a simple one. Very easy to make, I really liked the combination of colors and flavors. The kitchen smelled so good when it was in the oven. thank you so much for this recipe! i used it as a base recipe for dinner tonight for my non-vegan family and they all absolutely loved it! i added some vegan mayonnaise and cream cheese to the sauce as well and made it more like a layered vege pie with sweet potato, spinach, artichoke and eggplant and then poured the sauce over and baked and there were zero left-overs! thanks again and i’ll definately be making this regularly! You mention 3T of tofu mixture before saying to put the rice into the pie dish. Did you add the 3T of tofu mixture to the rice before adding the rice to the pie dish or do you put the rice in on it's own? Good recipe. I like the filling, but added an egg white to hold it together better (I'm not quite a vegan). The downside is that the rice crust is so crunchy it reminds me of eating raw rice! I think I'll do the filling with a regular crust next time. My incredible (non-vegan) friend made this for me for a gathering she hosted (she also made your cinn swirl muffins). As the only vegan there I was SO honored that she had a completely vegan meal! Anyway, she switched it up a tiny bit for what she had on hand but YUM! It was fabulous! I will be making it myself soon and frequently! Thanks Susan! I don't know how you do it, but really, you are amazing! How would you make this soy free? another great recipe. As you suggested in your recipe I did not cook the tips of the asparagus. I was a little worried that the crust wouldn't hold together but it was great and asparagus is easy to get right now. I may try to make two pies next time and freeze one before I cook it. Delicious. I’m putting it in my “keep” folder. Instead of shallots I used 1/2 a cup of chopped onions. I added 1/4-1/3 cup thawed frozen chopped spinach (excess liquid spooned off) to the tofu mix and whizzed it together for a beautiful green colour. I added 1/2-2/3 cup thawed frozen peas after the mushrooms were cooked. Also my tofu was soft silken, and it worked fine (but firm would work better). I made this the other day for my very skeptical mother-in-law. She loved it. I linked it to in my blog because it is going to become one of my cooking for omni specials. 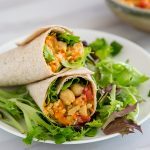 This looks amazing and I’m going to try it this weekend (and I’m not even vegan, not even a vegetarian!). I was just wondering if you had a specific sized pie pan in mind. Either an 8- or 9-inch deep dish pie pan will do. Hope you enjoy it! when you say “4 servings: 233 cals,” do you mean that 4 servings is that amount of calories, or that there are 4 servings & 1 is that many calories? sorry, i’m just a bit confused lol. but i can’t wait to try this! except with onions instead of shallots(not a fan of them), & no bell peppers either. Sorry! It should say “4 Servings. Each serving contains….” In other words, one-fourth of the quiche contains 233 calories. This looks great. Ive just recently started experimenting with tofu and this sounds fun. Do you think it would be good with a little rice cheese on top? This quiche turned out great. I started making it too late to eat for dinner so I put it in the fridge and had it for breakfast this morning. Just as good the next day. I made this yesterday and it came out great! All of my lunch guests gobbled it up. Thank you so much for sharing this recipe. 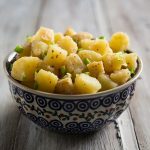 I actually have a blog as well where I share recipes with my readers and I would love to share my version of this recipe (with a link to your site and giving you appropriate credit, of course). I looked on your website for an email address, but have not found one so I hope it is ok that I share your recipe on my website. I can be reached at peninabareket@gmail.com. Thanks again and I love your blog! Made this (with a few modifications) for Christmas breakfast. It was incredibly delicious and simple to make. I used GoLean vegan sausage, browned and crumbled, instead of mushrooms. Broccoli (12 oz) replaced the asparagus in my version. Everyone agreed it was better than any “real” quiche they had ever had. Hi, Susan. I made this last night and it was so delicious and very filling. It was so good that I ate a third of the dish. I didn’t have shallots so I use some onion and I think the only other thing I did different, is that I added some red pepper flakes to the recipe. I just want to let everyone know what a great recipe this is so they’ll give it a try. It’s a dish that would be great for any time of the day, for any meal. I may try, like another poster mentioned, to make this up and freeze it before baking. Susan, do you see a problem with freezing this? Will it change the structure of the sauce? Thanks! Thanks so much for the feedback and for mentioning it on your blog! I haven’t frozen it, so I can’t say for sure, but other recipes with cooked tofu freeze well, so I think it will be okay. If you freeze it, please let me know how it comes out. Thanks so much for a wonderful recipe, I just made this tonight and my kids loved it too. I added a teaspoon or so of miso paste instead of salt. So good. So good to be vegan (almost 2 years, shame not longer). Cheers! The only place I can find nutritional yeast is at the local health food store. They have it both in bulk and in packages from the Red Star company (Red Star Vegetarian Support Nutritional Yeast). Some people have found it in regular grocery stores, but I haven’t seen it there. If there’s a Whole Foods or other natural food store in your area, try there. My secret to brown rice is to use a rice cooker. I just use a regular old cheap one you can buy at Wal-Mart. I just set it and it makes the rice perfectly. I usually use Lundberg rice. I found a great way to cook all rice and quinoah as well. Just boil it in a lot of water for the amount of time states on the package, the drain in colander . Voila! You do not need to use 2 parts water and 1 part rice. The best thing about this is you never get rice stuck on the pot!! Hope this helps.. I just made this for dinner tonight and it turned out wonderful! I just made a few modifications: I used a whole pound of asparagus, a whole small red bell pepper, and a 8 oz. package of sliced mushrooms. And, unsweetend almond milk instead of soy. I was worried I’d have too much filling with the extra veggies, but I filled it up to the top of my 8 inch pie plate and it was perfect! Next time I might add a touch of lemon juice with the tofu mixture. Thanks for a great recipe! Gobsmacked! I’ve been following the Slimming World regime for 6 months and have been making a weekly crustless quiche which is actually just a baked frittata, but have missed the crust so much. Rice is free food in Slimming World so this will work perfectly as a free food. Can’t wait to produce this at the next group tasting! I will be sure to let them all know where it comes from! Susan, you’ve been elevated from Genius to Goddess! Hi, I just put this quiche in the oven, it looks good, but just as I was combining the veggies and the filling I looked at the recipe again and saw that I should have pre baked the rice crust!! I can’t believe I missed that step! I hope it is ok. Thank you for the wonderful recipes! I just finished making the asparagus and mushroom quiche for the second time. This time I made it truly fat free by using only water to steam fry the veggies and using cupcake cups for individual quiche servings. The first time I made this recipe was for a holiday party at my non vegan brother in laws house. It was gone in a few minutes!! That’s says it all!! Thanks for the great recipe!! Would this work with regular Tofu? I haven’t found silken tofu anywhere here yet. I used regular firm tofu and it was great. Have been vegetarian/ vegan for a year and a half now and have recently decided to stop eating gluten. This is one of the most creative recipes I have seen in a long time–thanks so much! Even better the next day…and the day after. Just a little zap in the microwave and you’re golden. I love new recipes, trying to get back to vegan. The recipes help a lot! thank you. WONDERFUL! I’m new to the vegan world so I was pretty aprehensive. Only change I made was to omit the cheese (won’t do fake cheese) and I mixed the veggies in with the tofu mixture prior to putting it into the crust. Much easier, great presentation. I still reserved the tips for the top. Meant to take a pic, but totally forgot. I promise it was gorgeous, though. Potluck appropriate, too! Thanks for a fantastic recipe ! I made as a part of a family party buffet. It was perfect, even the non-vegan guests commented on its deliciousness ! Your step by step, clear instructions made it simple and a pleasure to prepare – I will certainly be making again ! My supermarket had asparagus on sale (it seems odd for this time of year, but I couldn’t pass up the chance). And, of course I came poking around here to figure out something new to do with them for Saturday brunch. So happy I found this one. The yummiest! 🙂 And that brown rice crust–AHH, so good! My substitutions/additions: As per a suggestion, I sub’ed 1/2 c onions for the shallots; used extra firm regular tofu (all I had on hand); omitted the parmesan and used 3 T nutritional yeast instead of the two (that stuff is a gift from the vegan gods); added about 1/4 t black salt (maybe a little more next time); and used a square 8-in pan (I don’t have a deep-dish circular one). All in all, no major changes. This was incredible. When my husband came home after a hard day at work he said, “How can you have quiche without cheese?” He ate at least 3 pieces and took the last piece with him for lunch. He had a hard time believing there were no eggs. I did cheat and use a pre-made Pillsbury pie crust, but would like to try the rice crust next time. I figured I could only try so many new things on my family at a time. Susan …. I made this recipe today and the lifestyle I’m on does not allow for tahini, oil, or parmesan cheese. It turned out WONDERFUL. This is a recipe I will make again and again. Oh … I also used 14 oz. of extra firm tofu instead of the 12 oz. of silken tofu.